JoTiKa Ltd. ~ HMS Victory Construction Page 2. It is our intention to produce the most historically accurate model of H.M.S. Victory, as she was at Trafalgar. As you may be aware H.M.S. Victory is in the process of being restored to her original Trafalgar configuration in time for the bicentenary celebrations on October 21st 2005. We are working closely with the curator for H.M.S. Victory to ensure that all planned amendments to H.M.S. Victory will also be incorporated into our finished kits. The first model under construction is at a scale of 1:72. We are aiming for a release date of late April. As soon as we have a price we will publish it here. The second prototype model (on the left) compared to the original (on the right). Side view of basic assembly. The kit is built up using 18 bulkheads. Forward view showing top decks 'dry fitted' in place. Size comparison between Victory hull (back) and the Agamemnon hull (front). Even at a scale of 1:72 she's a big ship! Stern view of Victory basic assembly now complete. 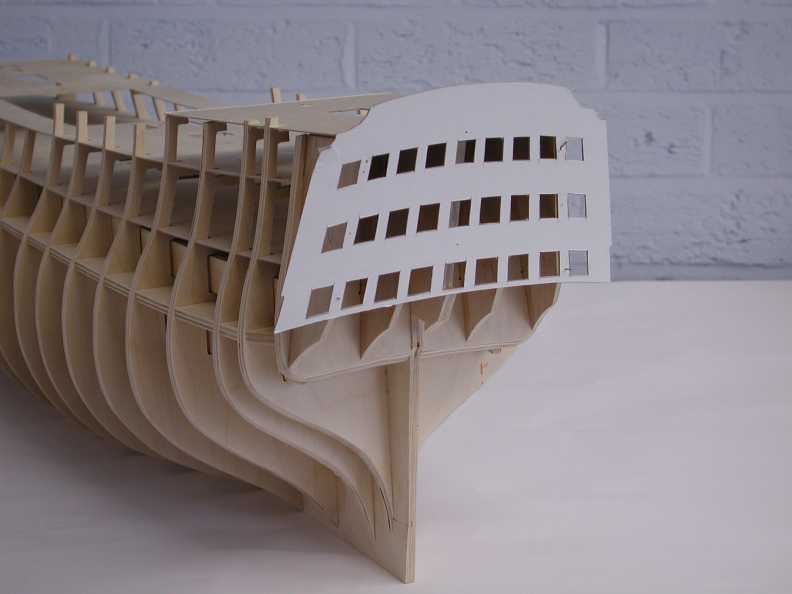 Stern view of the prototype model showing the stern fascia pattern. If it's new ideas you're after, how about this! Quarter deck and upper gun deck strip in place, incorporating pre cut gun ports ~ no need to mark and drill them out yourself! Lower gunport strip in place. This method which will be employed in the kit eliminates the need to mark out and cut the gunports. Approximately two hours work is involved in gluing these parts in place, as opposed to 2 or 3 weeks work if it were conventionally planked!